Paterson, New Jersey employees were punched into the city time clock at the same time they were doing private work at the mayor’s home on four different occasions, records newly released to the I-Team show. The I-Team reported last week Paterson employee Tim Hanlon was clocked in for the city on May 23, 2015 while surveillance video taken at the time showed him and another worker carrying a beer cooler into Mayor Jose Torres’ Arlington Avenue home. Now the I-Team has obtained three more time sheets that appear to show workers were charging taxpayers for time they spent at the mayor’s house. One of the time sheets belongs to Joe Mania -- the other man shown on videotape lugging the beer cooler into the mayor’s home on Memorial Day weekend. Mania’s time sheet shows he billed the city for six hours of overtime that day, from 5:39 a.m. to 12:11 p.m. Video shows him working at the mayor’s house during that time, at 11:31 a.m.
Two City workers in Paterson have come forward with claims that some of their coworkers are billing the taxpayers for work they didn’t do. The claim comes after the I-Team last week broke a story showing city workers doing personal work at the mayor’s private residence. In one case, city records show that a worker was on the clock earning overtime at the same time he was seen on video carrying a beer cooler into the mayor’s house. Now, two city employees – who asked that the I-Team protect their identities for fear that they will be retaliated against – are telling the I-Team that problems with timesheets are far-reaching. Chief Investigative Reporter Jonathan Dienst reports. A second man, Jorge Makdissi, is seen on video at the mayor’s house on five different occasions. 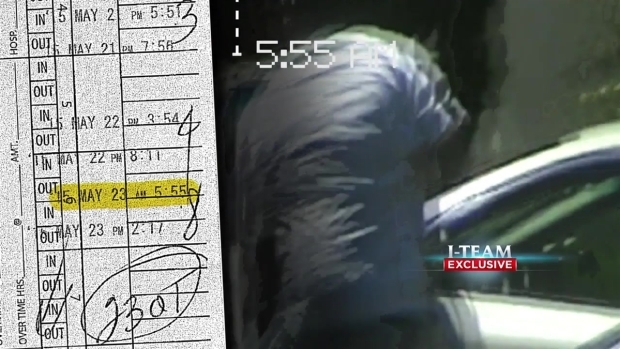 The I-Team obtained some of his time sheets Monday, and two of them appear to show that, on two separate dates, he billed taxpayers extra hours at the same time he was caught on video at the mayor’s home. The I-Team broke the story last week, based on numerous surveillance video taken by a private investigator over the course of more than a year, after the private investigator was hired by a developer in a permit dispute with the city. The videos show workers collecting what appears to be construction debris from the mayor’s home, washing his scooter and moving boxes. Workers were also videotaped working at a second location – a business tied to the mayor’s nephew. At times workers are seen in uniform, or with city vehicles. Torres has not answered the I-Team's requests for an interview. Last week, he said in an e-mail: "Please be advised that at no time has any city employee, on city time, or overtime, or paid with taxpayer dollars, ever performed work for me at my home, or anywhere else." Makdissi and several other workers reached by phone have told us they never billed taxpayers for private work, and some said the mayor paid them cash out of his own pocket or that they volunteered their time. Hanlon spoke to the I-Team last week, saying he thought he was off the clock May 23, the day he is shown carrying the cooler. He said it’s possible a supervisor clocked him in, or that he worked at a different time that day. Residents of Paterson, New Jersey were divided Friday in their response to the I-Team's exclusive report Thursday that city workers were videotaped on several occasions doing jobs at Mayor Jose “Joey” Torres’s private residence. Jonathan Dienst reports. Mania has not returned calls seeking comment. Meanwhile, the New Jersey state Attorney General’s office has launched an investigation into the matter. A spokesman for that office declined comment Tuesday. But the Paterson city attorney confirmed the attorney general had served subpoenas for records on the city Monday. The City Council was expected to hear from residents Tuesday for the first time since the I-Team broke the story last week. Torres was not expected to attend the meeting.